There are many different recipes for potato salad, but one of my favorite ones is the Suburban Potato Salad. I love the added color and texture created by the fruit and vegetables. It makes a very nice addition to other party foods, as well as a side dish for lunch, dinner, picnic, or barbecue. This recipe makes about 6 cups of salad. Wash the potatoes, leave skin on, cover with cold water, bring to boil and cook until semi-cooked (they should feel firm, when testing the center with a toothpick). Remove potatoes, drain, and cool off with cold water. Peel the potatoes, by scraping the peel off, and removing all the eyes. Cut into small (1/2 inch) cubes. Add onions, green peas, carrots, eggs, pickles, apple, dill, salt and pepper. Mix mayonnaise, sour cream, mustard and pickle brine. Pour over potato salad and fold in gently (do not over mix, as not to break down the vegetables). 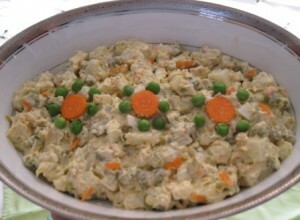 Make sure not to over cook the potatoes, carrots and peas, so that the salad does not become mushy, during mixing time. This looks really great and sounds a lot taster than ones that are loaded with mayo. I love the red skined potatoes…have you ever used lipton onion soup on red potatoes and baked them in the oven? Love them! Thanks for always sharing your recipes. Diana, thank you for sharing your tip on red skin potatoes. I have to try that recipe, since I love the combination of onions and potatoes. I had red potatoes served with a little bit of melted butter and fresh chopped up dill….it’s tasty as well. About some of the other potato salads, and macaroni salads…I agree, they use way too much mayo in them.